DRY ERASABLE, REUSABLE AND RECYCLABLE - Easy to clean. Clean with Dry or Wet wipe Just write on and easily wipe out. Fits Great on any Magnetic Receptive Area Reusable and Recyclable! EXTRA LARGE SPACES & LOOKS GREAT - Large Size of Each Grid. Have Plenty of Space to keep track of everyone's chores and activity schedule in a fun and colorful way. THE THICKEST PREMIUM MAGNET IN AMAZON - Made From the strongest 40mil Roll Sheeting. Overlayed with "Long Lasting" Clear Dry Erase Laminate Material. MULTI-PURPOSE - Designed this Planner to be used in multiple scheduling ways and to be versatile so that any sized family can use it! NO HASSLE MONEY BACK GUARANTEE - We know you'll love our calendar, that's why if you aren't 100% satisfied, we will provide you with a refund without any questions! IMPORTANT - USE ONLY HIGH-QUALITY MARKERS (NEON, FLUORESCENT, LIQUID CHALK, GLASS) - REGULAR DRY ERASE MARKERS WILL NOT WORK ON THE BLACK FLUORESCENT CALENDAR! DRY ERASABLE, REUSABLE AND RECYCLABLE - Easy to clean. Clean with Dry or Wet wipe Just write on and easily wipe out. Fits Great on any Kitchen Refrigerator, Office File Cabinet or Magnetic Receptive Area Reusable and Recyclable! EXTRA LARGE SPACES & LOOKS GREAT - 12" x 16" and Large Size of Each Grid. Have Plenty of Space to keep track of everyone's chores and activity schedule in a fun and colorful way. It makes it so easy for everyone to keep track of chores, responsibilities, activities, and more! Use in home, office, kitchen, business, classroom, or dorm to brighten up any space. People will do a Double-Take when They See This on Your Fridge and Appliance. THE THICKEST PREMIUM MAGNET IN AMAZON Made From the strongest 40mil Roll Sheeting: Compared to most magnetized sheeting at 20 mil or 10 mil. Overlayed with "Long Lasting" Clear Dry Erase Laminate. MULTI-PURPOSE: Designed this chart to be used in multiple scheduling ways and to be versatile so that any sized family can use it! Check out our pictures for different scheduling schemes. It's so versatile; choose to keep track of chores at home, school or the workplace. Keep everyone in the loop about activity schedules, work days, meal plans, babysitters and more. 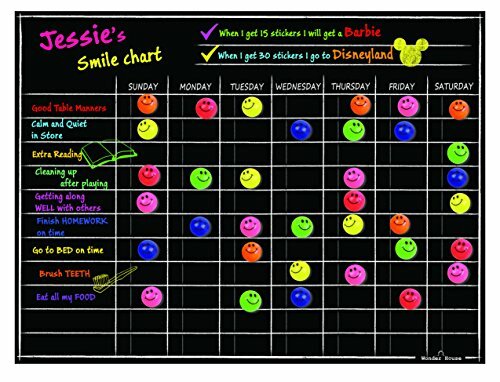 Or use this chart as a Reward / Star Chart for your kids or even office members.This Product with last for you! NO HASSLE MONEY BACK GUARANTEE - We know you'll love our calendar, that's why if you aren't 100% satisfied, we will provide you with a FULL refund without any questions! If you have any questions about this product by Wonder House, contact us by completing and submitting the form below. If you are looking for a specif part number, please include it with your message.